Corporate giving continues to increase, but some states do not reap the benefits. Corporate giving was up 17% in 2012 to a record $115 million. 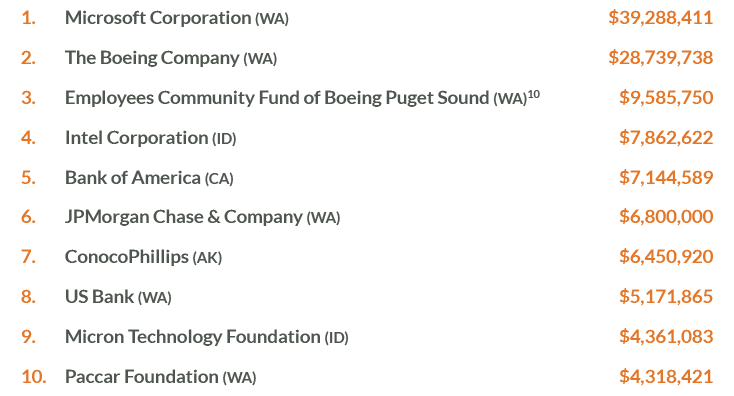 The Boeing Company, Burroughs Wellcome Fund, Alaska Airlines, Intel Corporation, The Paccar Foundation, Safeco Insurance Company and Microsoft Corporation all reported substantial increases in their giving. As in our last report, which also captured a significant increase in corporate giving, most of the growth occurred in Washington (+40%) and Oregon (+10%). Idaho, on the other hand, saw a 63% decline in corporate giving, which was largely due to a $7.2 million drop in contributions by the Micron Technology Foundation.